Many of us pay our taxes because it’s the law, or because we feel it our civic duty. But few of use actually enjoy it. And many of us have probably wondered what would happen if we didn’t pay our taxes. With millions of tax returns processed every year, would the IRS really notice if you didn’t pay your taxes? And what would the government do if you didn’t pay anyway? Besides, there are some people who can’t pay their taxes. What happens to them? Well, for most people, the IRS continues to send letters asking for payment until you either work out a payment plan or a lien is placed on your property. For the most extreme cases, there is the possibility of jail time. How Does the IRS Take Your Property? There are some options the IRS has when it wants to try to recover what you owe. One of the options is wage garnishment. The IRS has to let you know in advance, though. You will receive a written and itemized notice with how much you owe, and you are offered the chance to come up with a payment plan, or offer a settlement. If that doesn’t work out, the IRS can start taking your assets, including garnishing your wages. The IRS has to leave you a certain amount of money (based on the number of exemptions you claim) from each paycheck, and can take the rest. In addition, the IRS can place a tax lien on your property, or even seize some of your assets. And any future refund you are eligible for can be redirected to paying off your tax debts. Most taxpayers, even though it’s tempting to try to ignore the problem until it goes away, are actually better off if they try to work out a payment plan with the IRS. It’s usually possible to do so, and you avoid some of this other unpleasantness. Ordinary taxpayers rarely go to jail. 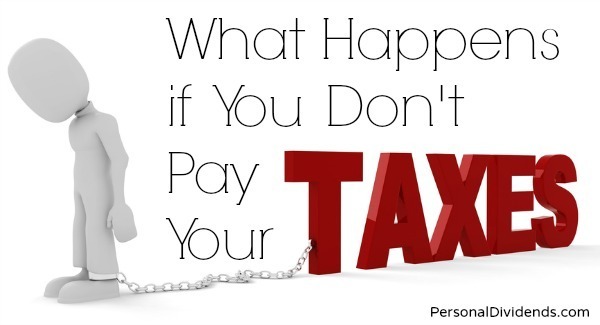 In order to go to jail for nonpayment of taxes, you have to be found guilty of criminal actions. This means that you have to have planned to evade your taxes. This can be a tough thing for the IRS to prove. For most of us, jail isn’t really possibility. The lien on your property can show up on your credit report and cause problems, and you can spend years trying to repay your back taxes and penalties (or settle), but you probably won’t go to jail unless there is a large — very large — amount of money involved, or you are a celebrity. Certain high profile individuals make nice examples for the rest of us, and we hear a lot about celebrities that serve time for tax-related offenses. However, most ordinary taxpayers don’t have to worry about going to jail. Unless you were actively avoiding payment (not due to hardship), or you are involved in some sort of “tax protest” to avoid paying, you probably won’t be prosecuted and sent to jail for non-payment.